isn’t very keen on the man or his ideas anymore. We should never lose sight of the fundamental question of truth. In regard to migrants, it seems to me that the Pope is too generic when he says to open the doors without thinking about the problem of the defense of the Christian identity and the European identity especially. It is true that Europe is composed of different cultures, but it is also true that there would be no Europe – as we know it today – were it not for Christianity, and also today’s Europe has known moments in history during which it had to defend itself against Islam. Concerning dialogue with Islam, I think that the Pope is superficial when he affirms that extremists exist in all religions. This is surely true, but it is equally true that Islam has a particular problem with violence and the origins of the problem are within the Koran. It is a given fact that we cannot ignore and the best way of helping our Muslim brothers is to make them realize it. St. Francis of Assisi before he died warned of a “Destroyer” who will cause “great Schisms” in a prophecy. Much of it rings true to Francis. “At the time of this tribulation a man, not canonically elected, will be raised to the Pontificate, who, by his cunning, will endeavour to draw many into error and death. Then scandals will be multiplied, our Order will be divided, and many others will be entirely destroyed, because they will consent to error instead of opposing it. There will be such diversity of opinions and schisms among the people, the religious and the clergy, that, except those days were shortened, according to the words of the Gospel, even the elect would be led into error, were they not specially guided, amid such great confusion, by the immense mercy of God. Let us hope and pray fervently that more people, like Mr. Valli, begin to awaken as to the reality of who Francis is and that they find the Faith! Did Aldo make the cover of his new book red for a reason? Dr. Viatcheslav Moshe Kantor presents Francis with a ketubah. In our previous post, never forget!, we touched upon what the members of the European Jewish Congress discussed when they visited with Francis at the Vatican on International Holocaust Remembrance Day. 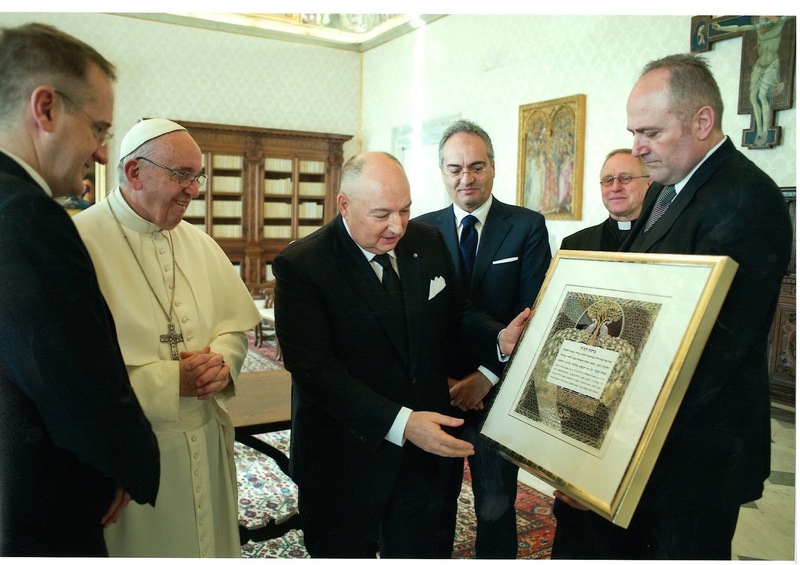 One thing which slipped past us, at Call Me Jorge..., was the gift (shown above and below) which we thought was simply, as the Opus Dei staffed Rome Reports implied, a framed piece of artwork containing “a special blessing of your [Francis'] home”. 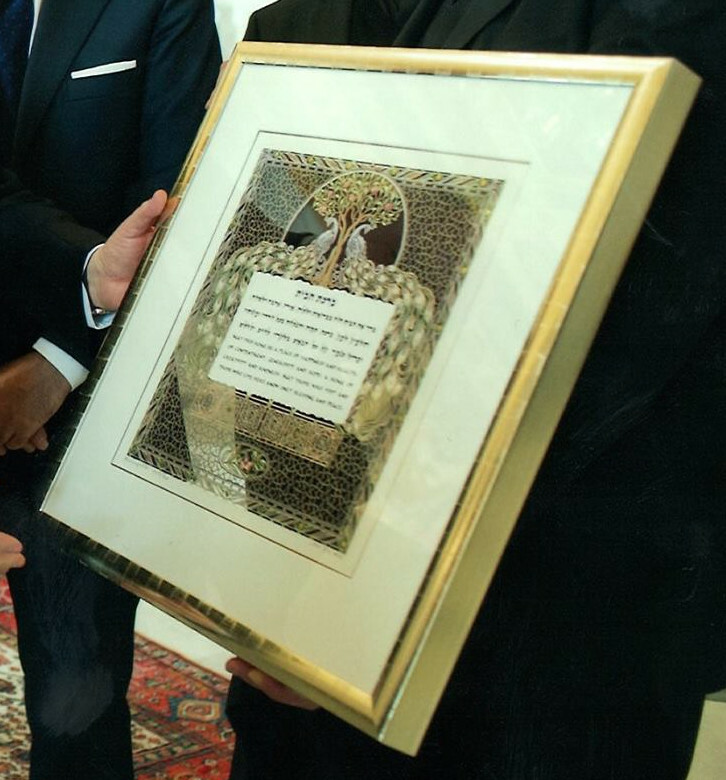 Thankfully, Tradition In Action knew what this “special Jewish blessing” is — a ketubah. Closeup of the ketubah given to Francis. — What is a Ketubah? source: The Jewish Marriage Contract: A Study in the Status of the Woman in Jewish Law by Rabbi Louis M. Epstein, page 31. Unable to find more than cursory video of the gift exchange we went over to photovat.com for the official photos from meeting. 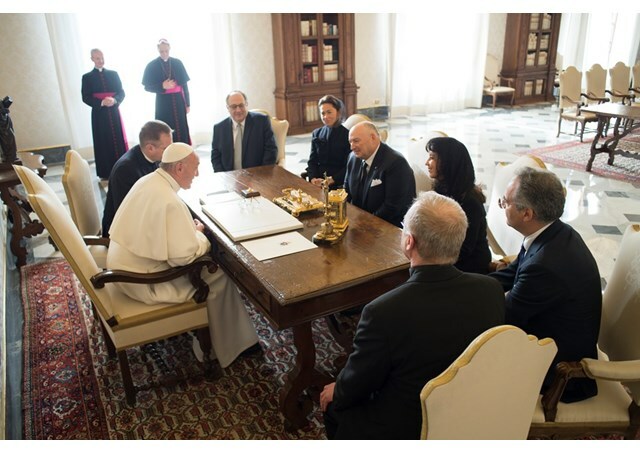 On page 4 of the many photos taken (linked to below) one can see Dr. Kantor presenting Francis with the ketubah, explaining it to him, and then the two men shake hands as if they had just completed a business transaction. 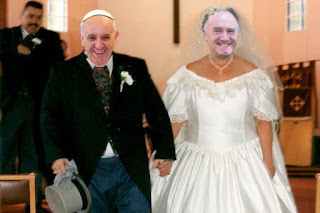 Call Me Jorge... concurs with Tradition In Action’s commentary — this is the marriage of Francis’ noahide Novus Ordo and Talmudic Judaism. Even though the intrigues and collusion go back hundreds of years it is the first time that we are aware of a symbolic marriage such as this taking place. 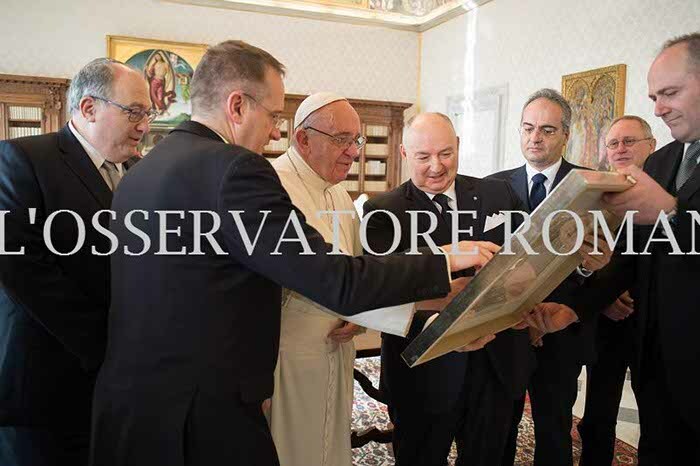 Kantor explaining to Francis the ketubah through the Vatican’s translator. The two men shake on the Babylonian contract. source for images: Servizio Fotografico - L’Osservatore Romano, Delegazione della European Jewish Congress, page 4, photos numbering — 00673_27012017 & 00674_27012017. Below are the five of the questions asked by Noel Diaz and Francis’ answers to them. In what can only be described as overblown (El Sembrador - ESNE promoted the interview as historical which it is anything but) and an in unusual format — after each question & answer, a panel which reminds us of ChurchMilitant.tv but with a Novus Ordo bishop, discusses what Francis said before returning to the interview. 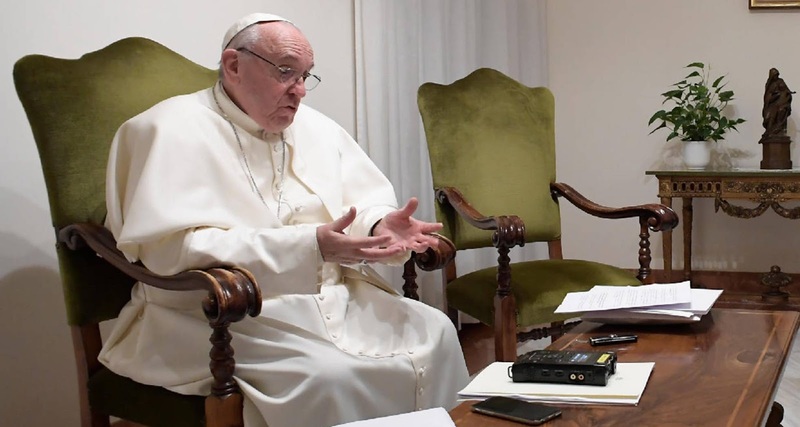 Below each question is cued up so those who want to listen to Francis don’t have to also suffer through the discussion panel. It’s only the first part of the show, the second part has yet to be posted. If and when the second part is posted we will include it. All that is left, is for Bp. Fellay to sign on the dotted line. Bishop Fellay is the Superior General since 1994 of the SSPX founded by Archbishop Lefebvre in 1970. 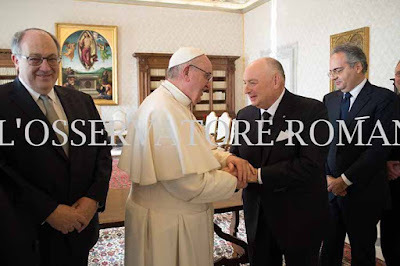 He exhibits in this interview the spirituality of the Society of St. Pius X and an update on the relations of the Society with the Holy See. After the lastest meetings between the Pope and Bishop Fellay, which resulted in new proposals, there seems to be no more than a "stamp" to conclude an agreement. This agreement is possible, according to the Superior General, in his view, without waiting for the situation in the Church to become completely satisfactory. Bp. Fellay has until July 2018 to sign the deal with Rome, when his second 12 year term as Superior General of the FSSPX finishes. Dr. Viatcheslav Moshe Kantor (Вячеслав Моше Кантор), the billionaire president of the European Jewish Congress, who equates populism with anti-semitism and Francis who equates populism with Nazism met today to discuss the importance of the Holocaust, the decline in morals among the once Christian nations of Europe, and how those morals can be restored with the help of Talmudic Judaism. Vladimir Putin kissing Moshe Kantor’s rear end! Is the reason Francis can’t answer 5 dubia because he is too busy granting interviews? A template of how the Israeli Lobby controls governments. Watching this superb four part series by Al Jazeera on the Israeli Lobby in Great Britain gives the viewer excellent insight as to how this Lobby functions. It demonstrates one of the aspects of the Israeli Lobby which Alison Weir writes of in her much recommended book, Against Our Better Judgment: The Hidden History of How the U.S. Was Used to Create Israel. After viewing these videos, one will better understand the ongoing relationship between Oren Heiman, Mordechay Lewy, and Maximilian Krah (formerly representing the Jaidhofer Foundation & the SSPX’s Della Sarto corporation) as well as Jorge Bergoglio’s friendships with Mr. Zimerman, Mr. Epelman, Mr. Kirzenbaum, Mr. Lauder, and Mr. Schlosser & rabbis Skorka, Bergman, and Avruj. Keep this template in mind also, as President Trump continues to appoint bureaucrats. While Donald Trump was taking the oath of office the rest of the world was being prepared to be subjected to one hour and fifteen minutes of this insanity! Unfortunately, Francis mind isn’t empty like his hands, instead it’s filled with garbage. Apparently Francis couldn’t bear the idea of Donald Trump stealing the limelight of the world for even one day, hence the motormouth gave a ranging interview which covers almost, but not quite, every inconsequential idea of his revolutionary mind. This interview published in the Spanish newspaper, El País, is linked to below in the Spanish, Portuguese, and English languages. It’s filled with the usual politically correct platitudes and pet-causes of Francis in the typical manner of Francis’ rambling stream of unconsciousness. One thing which can be said about Francis is that he has taken away the title of the most garrulous papacy from Karol Józef Wojtyła, for he shares every idea he has no matter how mundane or incorrect it is. Reality is a realm which Francis seldom occupies and this interview reflects it. So, here’s more verbal drivel from the mouth of the imbecile himself, if the reader can stomach it. On Friday, just when Donald Trump was being sworn in to office in Washington, Pope Francis was giving a long interview to EL PAÍS at the Vatican, during which he was calling for prudence in the face of the alarm bells that were ringing due to the new US president. 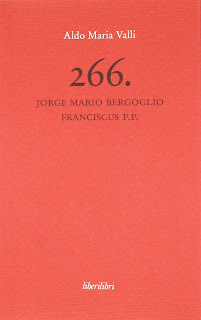 During an hour and 15 minutes, in a simple room in the Casa de Santa Marta, where he lives, Jorge Mario Bergoglio, who was born in Buenos Aires 80 years ago and is on his way to completing his fourth year as Pontiff, explained that “in the Church there are saints and sinners, decent men and corrupt men,” but that what most worries him is “a Church that has been anesthetized by mundanity,” one that is far from the problems of the people. Francis showed himself to be up to speed not just with what is happening within the Vatican, but also in the southern border of Spain or in the tough neighborhoods of Rome. He says that he would love to travel to China – “as soon as they invite me” – and that, although he sometimes “slips up,” his only revolution is the Evangelical one. Question: Your Holiness, after nearly four years in the Vatican, what is left of that street priest that came from Buenos Aires to Rome with the return ticket in his pocket? Francis: He is still a street priest. Because, as soon as I can go out on the streets to greet people at the general audiences, or when I am traveling... my character has not changed. I'm not saying that is deliberate: it has been a natural thing. It is not true that you have to change here. To change is unnatural. To change at 76 is putting on makeup. Perhaps I cannot do everything I want, but my street soul is alive, and you can see it. Question: In the last days of his papacy, Benedict XVI said about his last years at the head of the Catholic Church: "The waters ran troubled and God seemed asleep". Have you felt that loneliness too? The Church hierarchy was asleep with regard to people's problems, both new and old? Francis: Within the Church hierarchy, or among the Catholic Church's pastoral agents (bishops, priests, nuns, laymen), I am more afraid, rather than of those who are asleep, of those who are anesthetized. Those who are anesthetized by worldly affairs. They sell out to worldliness. That is what worries me. Everything is calm, everything is quiet, when everything goes right. Too much order. When you read the Acts of the Apostles, Saint Paul's epistles, it was a mess, there were troubles, people moved. There was movement and contact with people. An anesthetized person is not in touch with people. He protects himself against reality. He is anesthetized. Nowadays there are so many ways of anesthetizing oneself against the daily life, aren't there? Maybe the most dangerous illness for a pastor is the one produced by anesthetics, which is clericalism. I am here and the people are there. But you are those people's pastor! If you don't take care of those people, if you give up on taking care of those people, you should pack your bags and retire. Question: Is there a part of the Catholic Church that is anesthetized? Francis: It is a risk that we all have. It is a danger, it is seriously tempting. Being anesthetized is easier. Question: It is a better life, a more comfortable life. Francis: That is why, rather than those asleep, there is that anesthetized state that gives the worldly spirit. A spiritual worldly spirit. I am always struck by the fact that Jesus Christ, in his last supper, when he prays to his Father on behalf of his disciples, he does not ask "Look, keep from breaking the fifth commandment, keep them from killing, from breaking the seventh commandment, keep them from stealing". No, he says: "Keep them from the evils of the world, keep them from the world". The worldly spirit anesthetizes. When that happens, the pastor becomes a civil servant. And that is clericalism, which is the worst evil that may afflict today's Church. Question: The troubles that Benedict XVI faced towards the end of his papacy and that were inside that white box that he gave you in Castel Gandolfo, what are they? Francis: A very normal sample of daily life within the Church: saints and sinners, honest people and crooked people. Everything was there! There were people who had been questioned and were clean, workers... Because here, in the Curia, there are true saints. I like to say it. We talk too easily about the level of corruption in the Curia. And there are corrupt people. But there are also many saints. Men that have spent all their life serving people anonymously, behind a desk, or in conversation, or in a study, to get... Herein there are saints and sinners. That day, what most struck me was holy Benedict's memory. He said: "Look, here are the proceedings, in the box". An envelope twice this one. "Here is the sentencing of all the individuals". And here, "So-and-so, that much". He remembered everything! An extraordinary memory. And he retains it. Question: Does he feel alright, health-wise? Francis: Upwards, he feels fine. His problem are the legs. He needs help to walk. He has an elephant's memory, even in nuances. I may say something and he goes: "No, it wasn't that year, it was that other year". Question: What are your main concerns with regard to the Church and the world in general? Francis: With regard to the Church, I would say that I hope that it never stops being close. Close to the people. Proximity. A Church that is not close is not a Church. It's a good NGO. Or a good and pious organization made up of good people that does good, meets for tea and work in charity... The hallmark of the Church is its proximity, being close siblings. We all are the Church. Therefore, the problem we should avoid is breaking that closeness. Closeness among everyone. Being close is touching, touching Christ in flesh and blood through your neighbor. When Jesus tells us how are we going to be judged, Matthew chapter 25, he always talks about reaching to your neighbor: I was hungry, I was in prison, I was sick... Always being close to the needs of your neighbor. Which is not just charity. It is much more. Also, in the world, there is war. We have a World War III in little bits. Lately there is talk of a possible nuclear war as if it were a card game: they are playing cards. That is my biggest concern. I am worried about the economic inequalities in the world: the fact that a small group of humans has over 80% of the world's wealth, with all its implications for the liquid economy, which at its center has money as a god, instead of the human being. Hence the throwaway culture. Question: Your Holiness, about the world's problems that you have just mentioned, Donald Trump has just become the president of the US, and the whole world is tense because of it. What do you think about that? Francis: I think that we must wait and see. I don't like to get ahead of myself nor judge people prematurely. We will see how he acts, what he does, and then I will have an opinion. But being afraid or rejoicing beforehand because of something that might happen is, in my view, quite unwise. It would be like prophets predicting calamities or windfalls that will not be either. We will see. We will see what he does and will judge. Always on the specific. Christianity, either is specific or it is not Christianity. It is interesting that the first heresy in the Church took place just after the death of Jesus Christ. 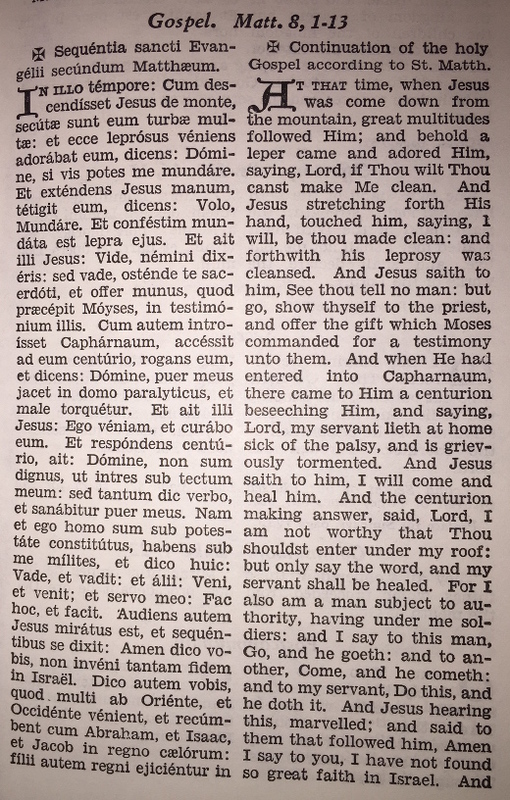 The gnostic heresy, condemned by the apostle John. Which was what I call a spray religiousness, a non-specific religiousness. Yes, me, spirituality, the law... but nothing concrete. No, no way. We need specifics. And from the specific we can draw consequences. We lose sense of the concrete. The other day, a thinker was telling me that this world is so upside down that it needs a fixed point. And those fixed points stem from the concrete. What did you do, what did you decide, how do you move. That is what I prefer to wait and see. Question: Aren't you worried about the things we have heard up until now? Question: For the most traditionalist sectors, any change, even if it is only in the language, amounts to treachery. For the other end, nothing is ever enough. You have said that everything was already written in the Gospel's essence. Is it then a revolution of normalcy? Francis: I try —I don't know if I succeed— to do what the Gospel says. That is what I try. I am a sinner and not always successful, but that is what I try. The history of the Church has not been driven by theologians, or priests, or nuns, or bishops... Maybe in part, but the true heroes of the Church are the saints. That is, those men and women that devoted their lives to make the Gospel a reality. Those are the ones that have saved us: the saints. We sometimes think that a saint is a nun that looks up to the heaven and rolls her eyes. The saints are the specific examples of the Gospel in daily life! And the theology that you learn from a saint's life is immense. There is no doubt that the theologians and the pastors are necessary. They are part of the Church. But we must come back to that: the Gospel. And who are the best messengers of the Gospel? The saints. You have used the word "revolution". That is a revolution! I am not a saint. I am not making any revolution. I am just trying to push the Gospel forward. In an imperfect way, because I make my blunders from time to time. Francis: There are two questions in there. The syndrome of the eldest child: I know that those who feel comfortable within a Church structure that doesn't ask too much of them or who have attitudes that protect them from too much contact are going to feel uneasy with any change, with any proposal coming from the Gospel. I like to think about the owner of the hotel where the Samaritan took the man beaten and robbed by thieves along the way. The owner knew the story, the Samaritan had told him: a priest had passed by, he looked the time, saw that he was late for temple and left the man abandoned, he didn't want to get blood-stained because that would prevent him from celebrating according to the law. A lawyer passed by, he looked and said: "I better not get involved, it will make me late, tomorrow in court I will testify and... No, it's better not to get involved". As if he had been born in Buenos Aires, he turned around, with that city's slogan: "Better not get involved". And then came this one that was not Jewish, he was a pagan, he was a sinner, he was deemed the scum, and he was moved and he helped him get up. The owner's astonishment was tremendous, because it was unusual. The novelty of the Gospel however astonishes because it is essentially scandalous. Saint Paul tells us about the scandal of the cross, the scandal of the Son of God become man. A good scandal, because Jesus condemns the outrage against children too. But the evangelical essence is scandalous by those days criteria. By any worldly criteria, it is an outrageous essence. So the eldest child syndrome is the syndrome of anyone who is too settled within the Church, the one who has everything clear, knows what must be done and doesn't want anyone to listen to strange sermons. That is the explanation for our martyrs: they gave their lives for preaching something that was upsetting. That is your first question. As for the second one: I didn't want to answer the German journalist right there, but I told him: I am going to think about it, you may be somewhat right... I am always talking about the middle class, even without mentioning it. I use a term coined by the French novelist Malègue, who talks about "the middle class of sanctity". I am always talking about parents, grandparents, nurses, the people who live to serve others, who raise their kids, who work... Those people are tremendously saint! And they are also the ones who carry the Church onward: the ones that earn their living with dignity, that raise their children, that bury their dead, that care for their elders, instead of putting them into an old people's home, that is our saintly middle class. From an economic point of view, today, the middle class tends to vanish more and more, and there is the risk that we take shelter in our ideological caverns. But this "middle class of sanctity": the father, the mother, who celebrate their family, with their sins and their virtues, the grandfather, the grandmother. The family. At the center. That is "the middle class of sanctity". That was a great insight on the part of Malègue, who writes a sentence that is really impressing. In one of his novels, Augustine, an atheist asks him: "But you believe that Jesus Christ is God?" He is presenting the problem: Do you think that the Nazarene is God? "For me, it is not a problem", is the protagonist's answer, "the problem would have been if God didn't become Christ". That is "the middle class of sanctity". Question: Your Holiness, you have mentioned the ideological caverns. What do you mean by that? What are your concerns in this regard? Francis: It is not a concern. I am stating the facts. One is always more at ease in the ideological system that he has built, because it is abstract. Question: Has it been exacerbated in recent years? Francis: It has always existed. I would not say it has been exacerbated, because there has also been much disappointment. I think there was more in the period before World War II. I think. I haven't given it much thought. I am putting things together... In the restaurant of life you always get many ideological dishes. Always. You may always take refuge in that. They are shelters that prevent you from connecting with reality. Question: Holy Father, these years, during your trips, I have seen you get emotional and move many who listened to you... For instance, I remember three very special occasions: in Lampedusa, when you asked whether we had cried with the women who lose their children to the sea; in Sardinia, when you spoke about unemployment and the victims of the global financial system; in the Philippines, with the tragedy of the exploited children. My questions: What can the Church do about it, what is being done, and what are governments doing? Francis: The symbol I proposed for the new Migrations office —in the new structure, I took directly over the department of Migrations and Refugees, with two secretaries— is an orange life jacket, such as the ones we know. During a general audience, there was a group of people working to rescue refugees in the Mediterranean. I was passing through, greeting people, and a man had that thing in his hand and started to cry, on my shoulder, and he went on and on: "I couldn't, I didn't get to her, I couldn't". And when he calmed a little he told me: "She wasn't over four years old, the kid. And she went down. I am giving this to you". This a symbol of the tragedy that we are living. Yes. Question: Are the governments raising to the occasion? Francis: Every one does what they can or what they want. It is a very hard judgment. Undoubtedly, the fact that the Mediterranean has become such a graveyard is food for thought. Question: I would like to know if you feel that your message, your approach to the margins, to those who suffer and are lost, is welcome, is accompanied by a machine perhaps used to a very different pace. Do you feel that you and the Church go at a different pace? Do you feel protected? Francis: I think that, fortunately, the responses are generally good. Very good. When I asked the parishes and the schools in Rome to take in immigrants, many said that it had been a failure. It is not true! It was not a failure at all! A high percentage of Rome's parishes, when they didn't have a big house or they had a very little one, they had their parishioners rent an apartment for an immigrant family. In convent schools, whenever there was room, they welcomed an immigrant family... The answer is that we have done more than you know, we haven't advertised it. The Vatican has two parishes and each parish has an immigrant family. An apartment at the Vatican for one family, another for the other one. The response has been constant. Not a 100%. I don't know the proportion. I think maybe 50%. The reception policy has several phases. There is an emergency reception: you have to welcome them, because otherwise they drown. Italy and Greece have led by example. Even now, Italy, with all the problems caused by the earthquake and all that, still cares for them. They welcome them. They get to Italy because it is the nearest shore, of course. I think they also get to Spain through Ceuta. But rather than staying in Spain, most of them tend to go north, in search of better opportunities. Question: But in Spain there is a fence in Ceuta and Melilla, they cannot go through. Francis: Yes, I know. And they want to go north. So the problem is: welcome them, yes, for a couple of months, give them accommodations. But the integration process must start at some point. Receive and integrate. The model for all the world is Sweden. Sweden has nine million people. Of those, 890,000 are "new Swedes", children of immigrants or immigrants with Swedish citizenship. The Foreign minister —I think it was her, the one who came to send me off— is a young woman, the daughter of a Swedish mother and a father from Gabon. Immigrants. Integrated. The problem is integration. On the other hand, when there is not integration, they get "ghettoized", and I am not blaming anyone, but it is a fact that there are ghettos. It may be that they didn't realize at that time. But the young guys who committed the atrocity in Zaventem [airport] were Belgian, they were born in Belgium. However, they lived in an immigrant neighborhood, a closed neighborhood. So the second phase is the key: integration. So much so that, what is the big problem for Sweden now? It isn't that they don't want any more immigrants to come, no! They can't get enough of the integration programs! They wonder what else can they do to get more people to come" It is astonishing. It is an example for the whole world. And it is nothing new. I said it right from the start, after Lampedusa... I knew of Sweden because of all the Argentinians, Uruguayans, Chileans that went there in the era of the military dictatorships and were welcomed there, I have friends who took refuge there and live there. You get to Sweden and they give you a healthcare program, and documents, and a residence permit... And then you have a home, and the following week you have a school to learn the language, and a little bit of work, and you are on your way. In that respect, Sant'Egidio, in Italy, is another model. The people who came with me on the plane from Lesbos, and nine others who came afterwards. The Vatican is in charge of 22, and we are taking care of them, and they are slowly becoming independent. The second day, the kids were going to school. The second day! And the parents are getting gradually settled, in an apartment, with a bit of work here, a bit of work there... Instructors to teach them the language... Sant'Egidio has that same attitude. So, the problem is: urgent rescue, of course, for everyone. Second: receive, welcome as best as possible. Afterwards, integrate. Question: Your Holiness, half a century has passed since almost everything happened. The Second Vatican Council, Paul VI's trip to the Holy Land and his embrace with Patriarch Athenagoras. Some people say that in order to know you one must know Paul VI. He was to a point the unappreciated Pope. Do you feel also that way, an uncomfortable Pope? Francis: No, no. I think that I should be more unrecognized because of my sins. Paul VI was the unappreciated martyr. (...) Evangelii gadium, which frames the pastoral principles that I want for the Church, is an update of Paul VI's Evangelii Nuntiandi. He is a man who was ahead of history. And he suffered a lot. He was a martyr. There were many things that he wasn't able to do, he was a realistic person and he knew that he wasn't able and he suffered for it, but he offered his suffering. He did what he could. And the best thing that he did was planting the seeds. The seeds of things that history collected afterwards. Evangeli Gadium is a mix of Evangeli Nuntiandi and the Aparecida document. Things that developed from the bottom. Evangeli Nuntiandi is the best pastoral paper after the Council, and it still is current. I don't feel unrecognized. I feel accompanied by all kinds of people, young people, old people... There are some who don't agree, of course, and they have the right, because, if I felt bad because someone disagrees with me, I would have the germ of a dictator in me. They have the right to disagree. They have the right to think that the path is dangerous, that the outcome may be bad, they have the right. But provided they talk, that they don't hide behind others. Nobody has the right to do that. Hiding behind others is inhumane, it is a crime. Everyone has the right to debate, and I wish we all would debate more, because it creates a smoother connection between us. Debating unites us. A debate in good faith, not with slander nor things like that. Question: You don't feel uncomfortable even with power? Francis: But I don't have the power. The power is something shared. The power exists when we make decisions that have been meditated, talked about, prayed, prayer helps me very much, it is a great support for me. I don't feel uncomfortable with power. I feel uneasy with certain protocols, but that is because I come from the streets. Question: You haven't watched TV for 25 years now, and I hear that you never were very fond of journalists, But you have reinvented the whole communication system of the Vatican, you have made it professional and have made it into a dicastery. 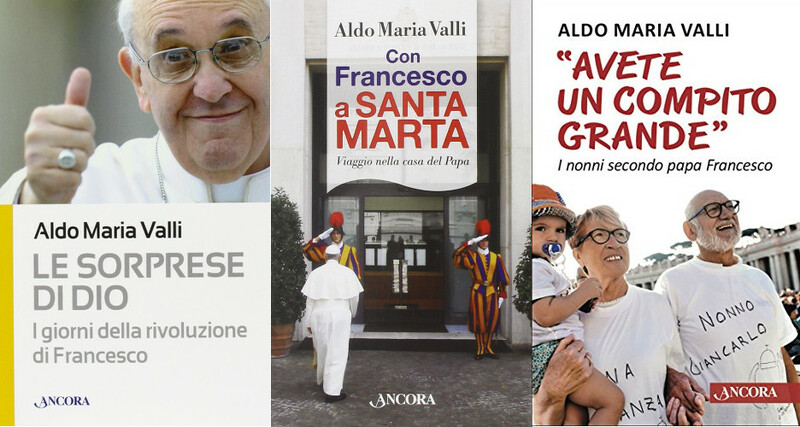 Are media that important for the Pope? Is there a threat against the freedom of the press? Can social media be detrimental for the freedom of the individual? Francis: I don't watch television. I simply felt that God was asking that of me, July 16, 1990, I made that promise, and I don't miss it. I only went to the television center that was next to the archbishopric to watch a couple of films that I was interested in, that I thought appropriate for my message. I used to love the movies, I had studied a lot about cinema, most of all the Italian cinema of the postwar period, Italian realism, and the Polish director Wajda, and Kurosawa, and several French directors. But not watching TV didn't prevent me from communicating. Not watching TV was a personal decision, nothing more. Communication comes from God. God communicates. God has communicated with us throughout history. God doesn't exist isolated. God communicates, and has spoken, and has accompanied us, and has challenged us, and has made us change course, and he is still with us. You cannot understand Catholic theology without God's communication. God is not static up there, watching how people have fun or ruin themselves. God gets involved, through the word and through his flesh. And that is my starting point. I feel a little afraid when mass media don't express themselves with an ethos of their own. For instance, there are ways of communicating that, instead of helping, weaken unity. A simple case. A family that is having dinner without conversation, because they are watching TV or the kids are with their phones, texting people that are somewhere else. When communication loses the flesh, the human element, and becomes liquid, is dangerous. It is very important for families to communicate, for people to communicate, and also in the other way. Virtual communication is very rich, but there is a risk if it is lacking human, normal, touching communication. The concrete element of communication is what will make the virtual element take the right course. As we see, the specific is non-negotiable, in everything. We are no angels, we are concrete individuals. Communication is key and must go forward. There are risks, as in everything. We must make adjustments. But communication comes from God. There are deficiencies. I have spoken about the sins of communication in a lecture I gave in ADEPA, in Buenos Aires, the association that bring together Argentinian publishers. The chairmen invited me to a dinner in which I gave this lecture. I signaled the sins of communication and said: don't commit them, because you have a great treasure in your hands. Today, communicating is divine, it always was, because God communicates, and is human, because God communicated in a Human way. So, for functional purposes, there is a dicastery, to channel all this. But it is a functional thing. It isn't because communicating is important today. Communication is essential to the human being, because it is essential to God. Question: The Vatican's diplomatic machine works at full capacity. Both Barack Obama and Raúl Castro thanked it publicly for its work during their rapprochement. However, there are other cases such as Venezuela, Colombia or Middle East, that remain blocked. In the first case, the parties even criticize the Vatican's mediation. Do you fear that the Vatican's image may suffer for it? What are your instructions in these cases? Francis: I ask the Lord that he give me the grace of not taking any measure for the sake of image. Honesty, service, those are the criteria. I don't think that getting a bit of makeup is a good idea. You make mistakes sometimes, your image will suffer, but it doesn't matter if there was goodwill. History will judge afterwards. And there is a principle, a very clear one for me, that must govern everything both in pastoral action and in Vatican diplomacy: we are mediators, rather than intermediaries. We build bridges, not walls. What is the difference between a mediator and an intermediary? The intermediary is the one that has for instance a real estate business, looks for someone who wants to sell a house and for someone who wants to buy one, the reach an agreement, he gets a commission, rends a good service, but he always gets something out of it, and rightly so, because it is his job. The mediator is the one who wants to serve both parties and wants both parties to win even if he loses. Vatican diplomacy must be a mediator, not an intermediary. If, throughout history, it has sometimes maneuvered or managed a meeting that filled its pockets, that was a very serious sin. The mediator builds bridges that are not for him, but rather for others to cross. walk on them. And he doesn't charge a fee. He builds the bridge and then he leaves. That is for me the image of Vatican diplomacy. Mediators, rather than intermediaries. Bridge builders. Question: Will that Vatican diplomacy extend soon to China? Francis: In fact, there is a committee that has been working for years with China, they meet every three months, once here and once in Beijing. There are many talks with China. China has always that aura of mystery that is fascinating. Two or three months ago they had the exhibition of pieces from the Vatican Museums in Beijing, and they were very happy about it. And next year they will come to the Vatican with their exhibits. Question: And will you go soon to China? Francis: As soon as they invite me. They know that. Besides, in China, churches are crowded. In China they can worship freely. Question: Both in Europe and in America, the repercussions of the crisis that never ends, the growing inequalities, the absence of strong leadership are giving way to political groups that reflect on the citizens' malaise. Some of them —the so-called anti-system or populists— capitalize on the fears in face of an uncertain future in order to form a message full of xenophobia and hatred towards the foreigner. Trump's case is the most noteworthy, but there are others such as Austria or Switzerland. Are you worried about this phenomenon? Francis: That is what they call populism. Which is an equivocal term, because, in Latin America, populism has another meaning. In Latin America, it means that the people —for instance, people's movements— are the protagonists. They are self-organized, it is something else. When I started to hear about populism in Europe I didn't know what to make of it, I got lost, until I realized that it had different meanings. Crises provoke fear, alarm. In my opinion, the most obvious example of European populism is Germany in 1933. After [Paul von] Hindenburg, after the crisis of 1930, Germany is broken, it needs to get up, to find its identity, a leader, someone capable of restoring its character, and there is a young man named Adolf Hitler who says: "I can, I can". And all Germans vote for Hitler. Hitler didn't steal the power, his people voted for him, and then he destroyed his people. That is the risk. In times of crisis, we lack judgment, and that is a constant reference for me. Let's look for a savior who gives us back our identity and lets defend ourselves with walls, barbed-wire, whatever, from other peoples that may rob us of our identity. And that is a very serious thing. That is why I always try to say: talk among yourselves, talk to one another. But the case of Germany in 1933 is typical, a people that was immersed in a crisis, that looked for its identity until this charismatic leader came and promised to give their identity back, and he gave them a distorted identity, and we all know what happened. Where there is no conversation... Can borders be controlled? Yes, each country has the right to control its borders, who comes and who goes, and those countries at risk —from terrorism or such things— have even more the right to control them more, but no country has the right to deprive its citizens of the possibility to talk with their neighbors. Question: Do you see, Holy Father, any sign of that 1933 Germany in today's Europe? Francis: I am no expert, but, with regard to today's Europe, I refer to the three speeches I have made. The two in Strasbourg and the third one on the occasion of the Charlemagne prize, the only award I have accepted because they insisted a lot due to the situation Europe was in, and I accepted it as a service. Those three speeches say what I think about Europe. Question: Is corruption the great sin of our times? Francis: It is a big sin. But I think that we must not think of ourselves as historically exclusive. There has always been corruption. Always. Here. If you read about the history of Popes, you will find some nice scandals... Just to mention my own house and not talk about others. There are examples of neighboring countries where there was corruption, but I will stay with my own. There was corruption here. A lot. Just think of Pope Alexander VI, and Lucrezia with her [poisoned] "teas". Question: What do you hear from Spain? What do you hear about how are your message, your mission, your work received in Spain? Francis: What I just got from Spain are some polvorones [shortbread] and turrón de Jijona [nougat] that I am going to share with the guys. Question: What do you think about it? Is it possible that the laicism process, in the end, will force the Catholic Church out to the margins? Francis: Talk. That is the advice I give to every country. Talk, please. A fraternal conversation, if you feel up to it, or at least in a civilized way. Don't throw insults at each other. Don't condemn before talking. If, after the conversation, you still want to insult the other, alright, but first talk. If, after the conversation, you still want to condemn the other, alright, but first talk. Today, with the level of human development, politics without talking is unconceivable. And that applies to Spain and to elsewhere. So, if you ask me for advice for the Spanish people, I say: talk. If there are problems, first, talk. Question: It is no surprise that from Latin America your words and your decisions are followed with special interest. How do you see the continent? How do you see your country? Francis: The trouble is that Latin America is suffering the effects —that I emphasized in Laudato Si— of an economic system that has the money god at its center, and that means policies that lead to a lot of exclusion. Which leads to a lot of suffering. It is obvious that Latin America today is the target of a strong attack from economic liberalism, the one I condemn in Evangelii Gaudium when I say that "this economy kills". It kills with hunger, it kills with a lack of culture. Migration flows not just from Africa to Lampedusa or Lesbos. Migration flows also from Panama to the Mexican-U.S. border. People migrate in search of something. Because liberal systems don't give them job opportunities and foster criminality. In Latin America there is the problem of the drug cartels, drugs that are consumed in the United States and Europa. They make them for the rich countries here, and they lose their lives in the process. And there are those who do it willingly. In my homeland we have a term to describe them: cipayos [sepoy]. It is a classic, literary word, included in our national poem. The cipayo es the one who sells his homeland to the foreign power who pays him the most. In the history of Argentina, for instance, there has always been a cipayo among the politicians. Or some political position worthy of cipayos. Always. So Latin America must rearm itself with political groups that recover the strength of the people. The biggest example for me is Paraguay after the war. The country lost the War of the Triple Alliance and was left almost entirely in the hands of women. And the Paraguayan woman felts that she had to rebuild the nation, defend their faith, defend their culture and defend their language, and she did it. The Paraguayan woman. She wasn't a cipaya, she defended what was hers, at the expense of anything, but she defended it, and she repopulated the country. I think that she is the most glorious woman in the Americas. That is the case of a position that never gave up. Of heroism. In Buenos Aires there is a neighborhood, on the bank of the Río de la Plata, where the streets bear the names of patriotic women, women who fought for independence, for their homeland. The women have more sense. Maybe I am exaggerating. So, I exaggerate. Correct me. But they have a stronger inclination towards defending their homeland because they are mothers. They are less cipayas. They are less at risk of being cipayas. Francis: Everywhere. In Europe... In Italy, for instance, I have visited organizations that rescue female prostitutes who are being taken advantage of by Europeans. One of them told me that they had brought her from Slovakia in a car trunk. They tell her: you have to earn such and such today, and if you don't bring it in, we will beat you. They beat her. In Rome? In Rome. The circumstances of these women, in Rome!, is terrifying. In the house that I visited, there was a woman that had had an ear cut off. When they don't earn enough, they torture them. And they are trapped because they are frightened, the abusers tell them that they are going to kill their parents. Albanians, Nigerians, even Italians. One very good thing this association does is that they go down the streets, approach the women and, instead of asking how much do you charge, how much do you cost, they ask: How much do you suffer? And they take them to a safe community so that they may recover. Last year, I visited one of those communities with recovering girls, and there were two men, two volunteers. And one of the women said to me: I found him. She had married the man who had rescued her and they were eager to have a child. The use of the woman is one of the worst things that are happening, also in Rome. The woman as a slave. Question: Don't you think that, after the failed attempt of the Liberation Theology, the Catholic Church has lost many points to the benefit of other denominations and even cults? What is the reason? Francis: The Liberation Theology was very positive for Latin America. The Vatican condemned the part that adopted the Marxist analysis of reality. Cardinal Ratzinger conducted two inquiries when he was Prefect of the Congregation for the Doctrine of the Faith. One, very clear, about the Marxist analysis of reality. And a second one that recovered some positive aspects. Liberation Theology had positive aspects and also deviations, mainly in the part of the Marxist analysis of reality. Question: About your relationship with Argentina. In the last three years, the Vatican has become a pilgrimage destination for politicians of all colors. Have you felt used? Francis: Ah, yes. Some say: We are having our picture taken, just as a souvenir, and I promise it will be for my personal use, I will not publish it. And before getting out the door it is already published. [He smiles]. Well, if that makes him happy, that is his problem. His quality as a person diminishes. The user is a small person. What can I do. It's his problem, not mine. There are many Argentinians in the general audience. In Argentina there always was a lot of travel, but nowadays, coming to a general audience with the Pope is almost mandatory. [Laughs]. There are also those who come and are my friends —I lived for 76 years in Argentina—, sometimes family, several nephews and nieces. But I have felt used, yes, there are people that have used me, my pictures, my words, as if I had said anything to them, and whenever someone asks me, I always respond: it's not my problem, I didn't say anything. But I am not getting into it. Everybody deals with his own conscience. Question: A frequent subject is the role of laymen and, most of all, the role of women in the Church. Your wish is that they have a bigger influence and even a role in decision-making. Those are your wishes. How far do you think that you will be able to get? Francis: We must not look at the role of women from a functional point of view, because that way, in the end, the women, or the women's movement in the Church, will be some sort of chauvinism in skirts. No. It is much more important that a functional demand. The functional aspect is alright. The deputy director of the Press room at the Vatican is a woman, the director of the Vatican Museums is a woman. The functional aspect is alright. But my concern is that women give us their thinking, because the Church is female, is Jesus Christ's wife, and that is the theological foundation of women. When they ask me, I say yes, but women could have more. But what was more important on Pentecost, the Virgin or the apostles? The Virgin. The functional aspect may betray it when we put the woman in her place. We must do that, no doubt. Because there is a long way ahead yet, and we must work so that she may give to the Church the freshness of her being and her thinking. Question: On some trips, I have listened to you addressing the churchmen, both from the Roman Curia and from the local hierarchies or even common priests and nuns, to ask of them more commitment, more proximity, even better humor. How do you think they receive those advices, those rebukes? Francis: My focus is always proximity, closeness. And it is well received in general. There are always more fundamentalist groups, in every country, in Argentina. They are small groups and I respect them, they are good people that prefer to live their faith that way. I preach what I feel that the Lord asks me to preach. Question: In Europe there is an increasing number of priests and nuns originating from the so-called Third World. What is the reason for this? Francis: A hundred and fifty years ago, in Latin America, there were more and more European priests and nuns, same as in Africa and Asia. Young churches expanded. In Europe there are no births. Italy has a rate below zero. I think that France is leading the way now, thanks to all the natality laws. But there are no births. The Italian welfare of years ago cut down births. We'd rather go on vacation, we have a dog, a cat, we don't have children and, if there are no births, there are no vocations. Question: In your consistories you have created cardinals from all over the world. How would you like the next conclave to be, the one that will elect your successor? Your Holiness, do you think that you will witness the next conclave? Francis: I want it to be Catholic. A Catholic conclave that chooses my successor. Question: And will you see it? Francis: I don't know. That is for God to decide. When I feel that I cannot go on, my great teacher Benedict taught me how to do it. And, if God carries me away before that, I will see it from the afterlife. I hope it will not be from Hell... But I want it to be a Catholic consistory. Question: I see you very happy to be a Pope. Francis: The Lord is good and hasn't taken away my good humor. 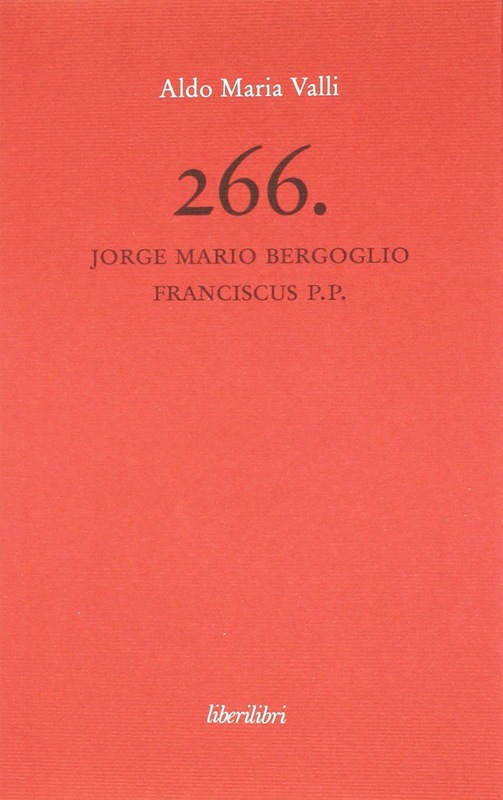 Translation from Spanish by María Luisa Rodríguez Tapia.